Preheat a nonstick skillet or pancake griddle over medium-low heat. Whisk together dry ingredients in a small mixing bowl. Add wet ingredients and mix just until no clumps remain. Gently fold in sprinkles (optional). Over-mixing will cause colors to bleed. Lightly coat skillet with cooking spray. Pour approximately 2 tablespoons of batter to form each pancake, making 4-5 silver-dollar pancakes. Cook over medium-low heat for 3 minutes per side until golden brown. Serve with your favorite toppings—light whipped topping, fresh fruit, syrup, etc. 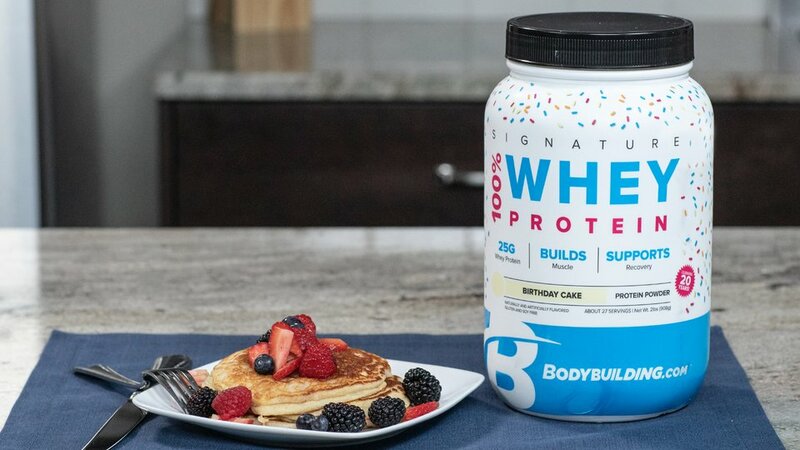 Sprinkle with chopped Signature Birthday Cake Protein Crunch Bar (optional).